Free download Animiz animation video software and create interactive animtated video on Windows platform. 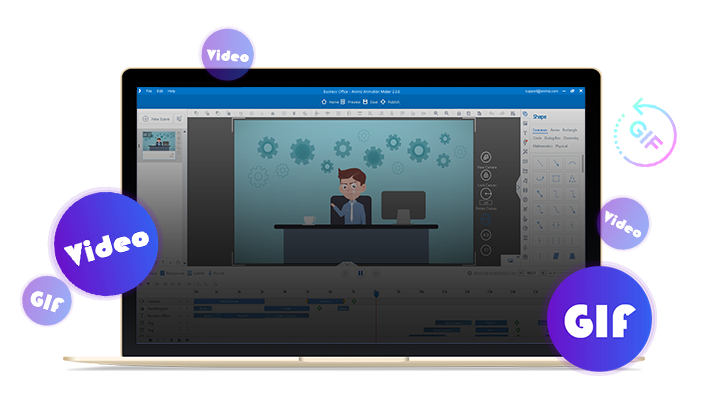 This is an amazing news for everyone especially the new beginners that Animiz would provide various kinds of stunning online templates for designing and creating professional animation video. What you need to do is just choose and open an appropriate online template. Replace and modify the basic contents with yours. And you will get a professional animation video which is just like a masterpiece. 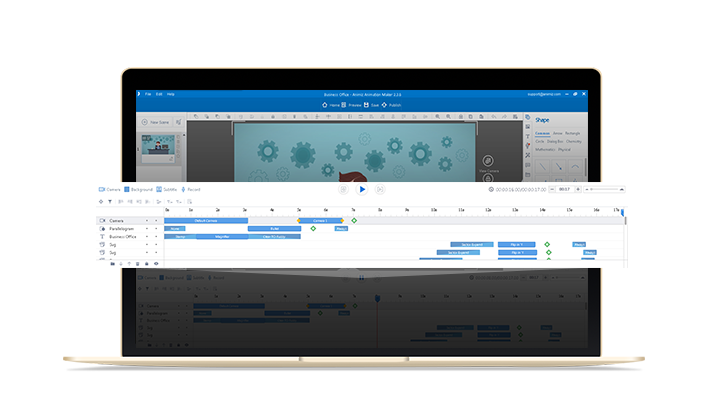 There is a powerful multifunctional Timeline in Animiz. Everyone is capable of designing and making their video an animated one. Firstly, you can add camera to capture detailed contents and to emphasize the key points. Secondly, add background for your video. Thirdly, combine subtitle and recording to better your animation video. Fourthly, add animation for all the objects needed in the canvas making them move in your video. With the help of this amazing Timeline, all of your video is under your control. It is so nice to add animated roles for your video. You have no need to be a professional designer or an engineer. 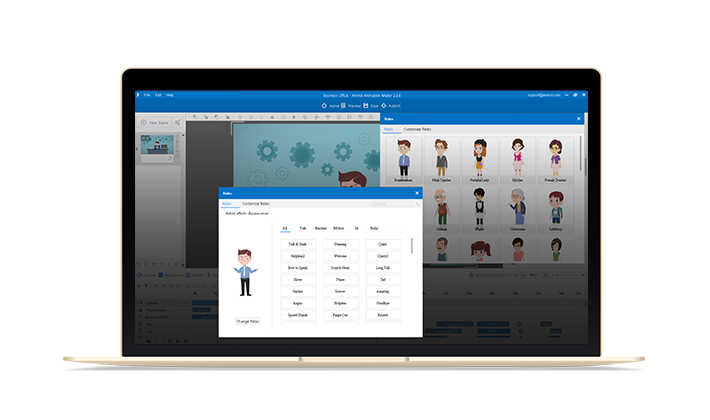 Animiz helps you to do that which provides various kinds of animated roles for most of fields, such as business, education, life, and public utilities. Each kind of role accompanies with different kinds of expressions and actions, helping you express your ideas in a better way. One click to apply the animated role to your video. After finished designing and making the Animiz project, you can easily publish it to video or GIF. In this way, it can be read offline or package it to be an e-mail to others. 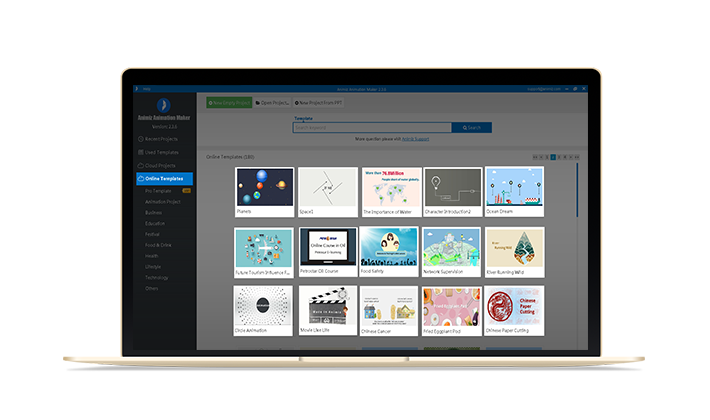 For better visual experience , you can publish the project as 6 video formats. (.mp4, .mov, .wmv, .avi, .flv, .mkv) In addition, you can customize video size, frame rate and voice rate before publication. So does the settings of publishing GIF. Choose some dynamic roles for your video for better visual experience and creativity.